Back in August, I signed up for Verizon Wireless Prepaid’s Bring Your Own Device, or BYOD plan using my iPhone 6. After using it for a few months my service expired at the end of October. So I thought it was time I shared my final thoughts on the about the service. 50% off Prepaid SIM KIT – Get a 4G LTE SIM Activation Kit including the first month of service & unlimited talk & text. I have to say I liked it, or most of it. Let me explain. So I signed up for monthly BYOD Plan. Like similar plans from other carriers, it offered Unlimited US Talk and Text. It also included unlimited text to Mexico and Canada, which is a nice touch. I signed up for the $45 plan, their $60 plan came also included unlimited talk to Mexico and Canada. Now, I don’t need that feature myself but if you need to call those countries that is a nice feature. Now, the $45 plan comes with 2GB of High Speed Data and the $60 plan comes with 5GB of high speed data. Both plans also come with Always-On Data, meaning that if you use up your high speed data, you’ll still be connected but at a much slower speed of 128Kbps. You’ll be able to send an emails and messages, but don’t count on watching video or listening to streaming music at those speeds. Even better, if you use up your data, you can buy more high speed data. You can by 500Mb, 1GB or 3GB, for $5, $10, or $15 respectively. The 500mb lasts for 30 days the other two options last for 60 days. This is a really nice feature. Glad to see it. Next, the have Mobile Hotspot. This lets you share your data connection from your phone with your laptop or tablet so you can connect them to the Internet. Really nice feature. I did a couple of videos about this. Check the channel for those. Now, in October, after I signed up, Verizon added their HD Voice service to prepaid. HD Voice is the name Verizon uses for a collection of services that use Voice of LTE or VoLTE technology. What does that mean to a normal person. Wi-Fi calling lets you make and receive calls using a Wi-Fi connection when your cellular signal isn’t strong. I did a video about Wi-Fi calling and voice and data at the same time, check those out on the channel. HD Voice also has some other features such as multiway calling and even video calls. Now, I want to add that you’ll need a phone that supports HD voice to get these features, for iPhone it looks like the iPhone 6 and later does. For Android, you’ll need to check verizonwireless.com to see if your phone does. So all this is a lot to like, what didn’t I like. Well the price, you get less high speed data with Verizon wireless than some other prepaids. Other services offer 5GB for $45-$50 dollars vs Verizon’s 2GB for $45. Now that’s not necessarily an apples-to-apples comparison. Because as far as I can tell Verizon doesn’t restrict the top speeds on their high speed data. I have some videos on the channel showing some pretty fast high speed data with Verizon. And some of you guys, out their have shared some pretty fast speed test results with me. Other services that use the Verizon network seem to all be limited to 5Mbps download speeds. Word is, that Verizon set that limit though. So your $45 2GB plan is getting you truly 4G LTE speeds and all the advanced features. Also, I need to mention auto-pay. With auto-pay, you let Verizon bill your credit card each month. When you sign up you’ll get 1GB of bonus data a month. Nice, and it make the offer more competitive. Other wireless companies offer a discount when you enroll in auto-pay. For me personally, I’d rather see a $5 discount. Now they charge $10 for 1GB or add on data, but I’d rather see the plan cost $40 for 2GB than $45 for 3GB. Because I don’t use that much data myself and I an buy the extra data myself. Finally, for me personally, I’d like better coverage at home. I get better coverage on the AT&T network, so I’m staying with that. But that is a personal choice for me, if Verizon worked better for me at home, I’d choose a service with that used their network. The SIM kits are on sale and eventually they go back to full price. I haven’t tried so I don’t know if they will let your transfer your current Verizon number to the new SIM every month. They might also figure it after a while. Verizon says on their support website that prepaid Verizon iPhone plans do not include VisualVoicemail, which I consider a requirement for business use of an iPhone. Your review doesn’t mention the lack of such support, which is a dis-service to your readers. Nice data plans. Nice text messaging. Good voice (if you have good Verizon coverage in your area), but totally broken voicemail. That they want I want my user experience to go “NOT”. And while Google Phone, or YouMail: can work around it with free 3rd party solutions, it is a hassle to setup (compared to the normally easy voicemail setup on an iPhone) and it means that the phone works differently than other people’s iPhone devices, which is a hassle for support. Thanks for the comment, but I disagree with you. 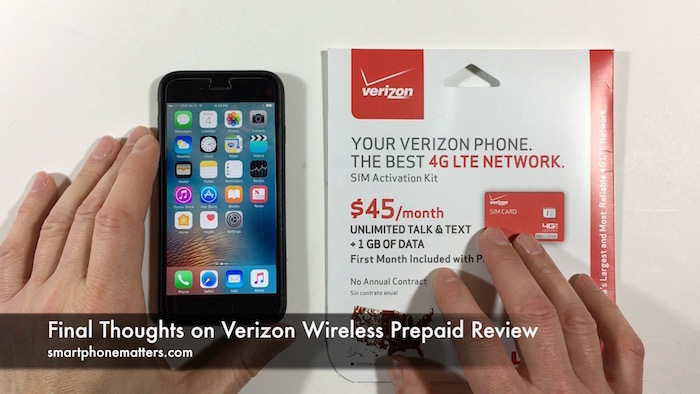 I clearly demonstrated Visual Voicemail for iPhone works( How To Sign Up For Verizon Wireless Prepaid Bring Your Own Device Plan) in my video at about 11:45 in. Further, if you read the Verizon prepaid FAQ under option 3. What features are available with my prepaid service?, it clearly lists Visual Voicemail as supported. Thanks Bob. I only asked because a Verizon FAQ (not the prepaid FAQ) said Visual Voicemail was not available on prepaid plans. it was an explicit bolder note. Based on your reference to the prepaid FAQ features list, I HAPPILY see you are correct for iPhone users, we are an exception to the general rule of no VVM feature o prepaid- we get VVM On prepaid. Too bad for Android users I guess. Great video. This type of video is of value to Canadian Snowbirds spending the winter in the USA. The text and calling to Canada is of interest to them. Thanks. I never thought of the snowbird issue. Thanks for sharing that.